Using a live video feed as an anchor background is becoming increasingly popular. In this type of setup, the image is projected onto an in-studio rear projection screen, flat-panel or chroma keyed in the picture. However, one downside is when nature gets in the way. Read more and see the video after the jump. 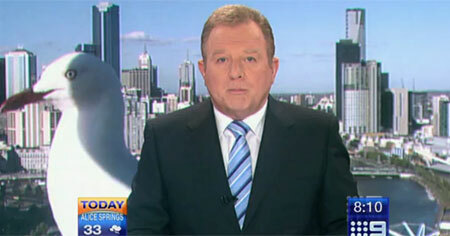 Australian anchor Peter Hitchener was reporting from in front of such a background when a seagull decided to walk in front of the camera capturing the live cityscape. The result was something oddly reminiscent of a cheap horror movie’s special effects. Hitchener told a local radio station he did in fact notice the seagull but didn’t let it rustle his feathers and kept reading his story. ‘”About 50 seconds to six o’clock this seagull arrived and started pecking at the camera and it had the beadiest huge eyes you’ve ever seen in your life,” he said. It’s somewhat surprising this doesn’t happen more often since there’s only so much that can be done to shield cameras from critters and other forces of nature. Some stations opt for using a recorded video loop instead, probably to avoid giant bird attacks like this, jittery backgrounds from blustery days and giant rain drops from appearing in the background. However, having a live view in the background is effective since it will accurately reflect the lighting and weather outside.